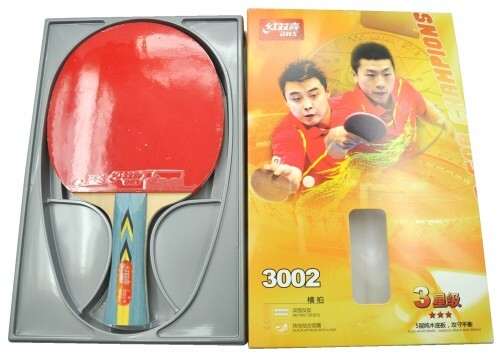 DHS (Double Happiness) is not only the largest table tennis manufacturer in China, but it's one of the national largest sporting goods suppliers. The company was founded in 1959 and is well-known and respectable in world table tennis field. Double Happiness (DHS), official equipment supply for 27th, 28th, 29th Olympic games, has its unique view point on the study of materials and formula, making technique, the mutual influence between table tennis and motor function. ?DHS makes constant efforts to offer the technical support to the development of world table tennis sport. Many of the world's top players. Many of DHS products have been approved by the I.T.T.F. (International Table Tennis Federation). 5 Ply pure wood blade with imported wood face layer which is strong and tough, you can borrow power of opponent to beat ball. The blade also keeps the characteristics of good balance and deep power. You can be free between attack and defend with X3 series racket. Recommended for professional or intermediate players.